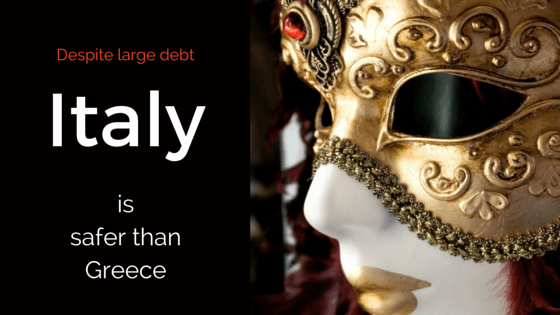 Italy has Europe’s second-highest debt burden as a proportion of GDP, with a national debt of 132% of its 2014 compared to an equivalent figure of 177% in Greece. Since Italy’s economy is significantly larger than that of Greece (being the third largest in the Eurozone behind Germany and France), the quantum of debt is actually larger. However, the current difference in perspective between the Italians, the Greeks and their respective governments make the more western state the safer economic prospect. While the Greeks continue steadfastly to oppose reform and budget cuts, Italians are coming to accept austerity and structural reform as their best hope under Prime Minister Matteo Renzi. As a result, Italy has been rewarded with 10-year-bond yields below 2.4% at the time of writing, while Greek debt with the same maturity has not been issued below 9.5% this year. However, some of these money-saving reforms are now under threat by Italy constitutional court’s ruling, which in April of this year declared part of the pension reform to be illegitimate. Although this could have financial repercussions extending into the billions of euros, Italy’s willingness to make sacrifices in order to meet its obligations stands it in good stead for obtaining new financing. After all, it was not Greece’s overall debt that pushed the country over the edge, but both sides’ intransigence at the negotiating table. Given some flexibility in austerity targets for funding constructive investment, Italy stands a fighting chance of no longer being the “sick man of Europe”. On the other hand, there remain a number of disincentives to private investment in Italy that the government cannot afford to remove for fear of reducing its revenue. Italy’s legal system is also notoriously slow and byzantine, so professional advice for navigating the incorporation process can be valuable. « Is Switzerland still a safe and secure place to invest your money?